Make Your Own Printed Circuit Boards In 8 Minutes! • No Negatives, UV Exposures or Darkroom Chemicals! The only 8 minute DIY circuit board fabrication system for making fast, inexpensive, high-quality, high-resolution PCBs with traces down to .005" using any conventional B&W laser printer or photo-copier. Say 'goodbye' to expensive board fabrication houses for your prototypes and special projects. 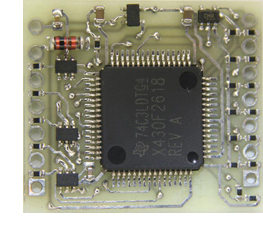 There is a much better way to fabricate your PCB's and make it an enjoyable experience with telephone Technical Support. Our site gives you a ton of information on every aspect of making fast, cheap PC boards. And you have our iron-clad guarantee..."you love it or we want it back"!